This NOAA satellite image shows Hurricane Ike in 2008. 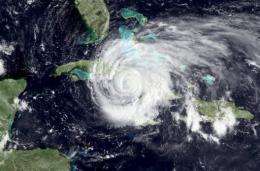 Weather experts on Wednesday reduced the number of projected hurricanes in the north Atlantic this season to four, two of them major hurricanes with winds above 178 kilometers (111 miles) per hour. Weather experts on Wednesday reduced the number of projected hurricanes in the north Atlantic this season to four, two of them major hurricanes with winds above 178 kilometers (111 miles) per hour. After one of the calmest starts to the hurricane season in a decade, the experts from Colorado State University said the development of an El Nino effect in the Pacific had caused them to scale back their projections for the Atlantic. The El Nino phenomenon, which involves changes in atmospheric pressure in the southern Pacific, occurs every three to six years, disrupting global weather patterns. In the Atlantic, El Nino events are associated with decreased levels of hurricane activity, said Philip Klotzbach and William Gray of Colorado State University. "We continue to call for a below-average Atlantic basin tropical cyclone season in 2009. We also anticipate a below-average probability of United States and Caribbean major hurricane landfall," they said. They now project that there will be 10 named tropical storms this season, of which four will become hurricanes, and two of those major hurricanes. Their earlier forecast in June had predicted 11 tropical storms and five hurricanes. "This is the quietest start for more than a decade. The last time a storm didn't form until August 5 was back in 1992," Klotzbach said. He added, however, that "a quiet start of the season doesn't necessarily mean that the remainder of the season is going to be quiet." "Obviously people in Florida need to be prepared for the hurricane season as every year. 1992 was a very quiet hurricane season but then hurricane Andrew formed and did... tremendous damage," he said. Meanwhile, two tropical storms have formed in the Pacific off the coast of Mexico, according to Stormpulse.com, a website that tracks weather patterns. The more powerful of the two, Enrique, was traveling in a northwesterly direction with wind speeds of 120 kilometers (60 miles) per hour. Farther out, a tropical stormed named Felicia also was traveling in a northwesterly direction toward Hawaii with winds of 72 kilometers (45 miles) per hour.